A deformity with hyperextension of the MTP joint and flexion of the IP joints is usually referred to as a claw toe. 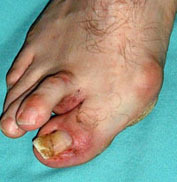 When the DIP joint is straight or extended the deformity is usually referred to as a hammer toe. However, the terms hammer and claw toe are sometimes used in confusing, ill-defined and contradictory ways (Schreier 2007, 2009). Always check what a paper means by these terms (they often don't tell you!). To start with, most toe deformities are flexible and easily corrected. With the passage of time, capsules and ligaments contract and deformities become fixed. Such contractures may have to be surgically released to correct the deformity (Myerson and Shereff 1990). The PIP joint should be tested with the MTP joint flexed 10-20 deg to relax the long flexors. A second toe with MTP instability may drift over or (less commonly) under the great toe. There is usually hallux valgus, which may have caused the instability in the first place. Kaz and Coughlin (2007) found hallux valgus in 49% of their patients, and hallux rigidus in 14%. Almost all in whom a draw test was documented had MTP instability. Although 44% had a 2nd metatarsal longer than the first, there was no evidence of first ray hypermobility or 2nd MT hypertrophy to suggest 2nd ray overload. 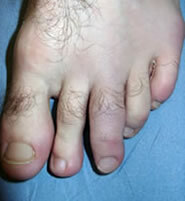 Early varus second toe with hallux valgus. The second toe is beginning to over-ride the hallux. 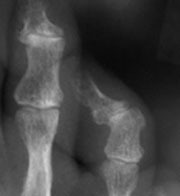 More severe deformity with painful pressure lesions between the toes. A deformity which mainly consists of flexion of the DIP joint is known as a mallet toe. There may be mild flexion of the PIP joint and extension of the MTP joint. The mallet toe is probably produced mainly by pressure of the toebox against a long toe. Congenital or acquired FDL tightness may also play a part. 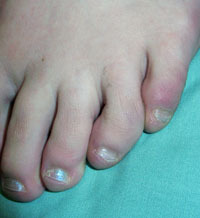 Various toe malalignments are seen in children. Most are of little significance. Complex toe deformities should suggest a malformation syndrome or a spinal anomaly. 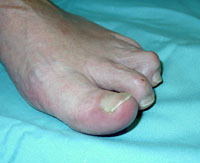 Thickened "sausage" third toe, usually due to a chronic inflammatory disorder such as psoriatic arthropathy, or infection.